I am always looking for healthy treat options for my dog, but it is hard to find quality treats that are not expensive. I have found the best way to get affordable and healthy dog treats are to make them yourself. The latest treat I made for Bruiser was also the easiest. There is only 1 ingredient and 2 easy steps, even cooking-challenged humans can manage this simple recipe. Pre-heat your oven to 250 °F, the key to these treats is drying them low and slow. After you rinse off your sweet potatoes cut lengthwise slices to your desired thickness between ¼” and ½”. Keeping your slices the same thickness will ensure they all finish at the same time. 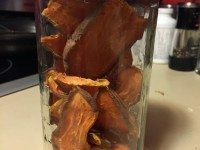 For big dogs cutting a large sweet potato lengthwise will produce a good size chew, but if you want smaller treats for your little guy you can use smaller sweet potatoes or cut the larger sweet potatoes in half first. I find cutting the sweet potatoes in half first also helps keep it stable by putting the flat edge down on the cutting board. Lay out the slices onto a baking pan lined with non-stick spray or parchment paper. Bake the sweet potatoes for about 3 hours flipping them halfway through. Bigger/thicker treats will require a longer baking time to dry; also, if your dog likes crunchier treats you can achieve that with a longer baking time and thinner slices. After baking let the sweet potatoes cool on a wire rack. Store in an airtight container; put them in the fridge or freezer if you want them to last longer. The treats may seem too soft at first, but they will continue to harden while cooling. If you are not happy with the chewiness after the treats are completely cooled then you can bake them again to dry them out more (if you and your dog can wait that long!). If you are lucky enough to own a dehydrator you can use that instead. Your dog will love this chewy delight and you can be happy knowing he is enjoying a healthy homemade treat that won’t break your bank!